Bitsbox is an innovative company started by two ex-Googlers that teaches children as young as 5 years old how to program apps. When they were featured on the popular ABC show, Shark Tank, this presented an excellent opportunity to capitalize on the increased brand exposure and drive more conversions through social media advertising. 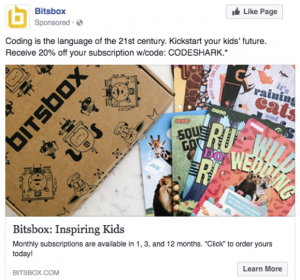 Knowing there would be a huge influx of visitors to the Bitsbox website, the Two Octobers and Bitsbox teams worked together to overhaul their paid Facebook advertising strategy and creative in just two weeks. We created complex remarketing audiences for visitors to the Bitsbox website based on how they engaged with it to draw them back in and convert. We also collaborated with the Bitsbox team to significantly increase Facebook advertising spend in anticipation of this large PR opportunity. With Shark Tank set to air, we increased spend over 3,500% that month and over 1,300% the following month. As anticipated, Bitsbox had their biggest month ever on Facebook advertising when Shark Tank aired. We generated a near 5,000% increase in conversions from a normal month with a decrease of 24% CPA (cost per acquisition). In addition, our ads drove a 128% increase in clicks with a 4.8% increase in impressions to the Bitsbox website. With the momentum of Shark Tank continuing into the beginning of the following month, our ads sustained the increase in conversions and exposure relative to spend garnering over 2.5 million impressions. The success in Facebook advertising also led Bitsbox to expand their social media advertising strategy into other channels such as YouTube and Twitter.